Our second iteration of an interactive poetry performance app, Diamonds in Dystopia debuted at TEDxLSU (3.5.16). Diamonds in Dystopia was also performed and discussed as an Experiential Storytelling panel during SXSW 2017. Our first iteration, "Causeway"(see below), was performed at NIME this summer in Brisbane, Australia. We recently published in article in Media-N detailing some of our thoughts about this project and the technology behind-the-scenes. 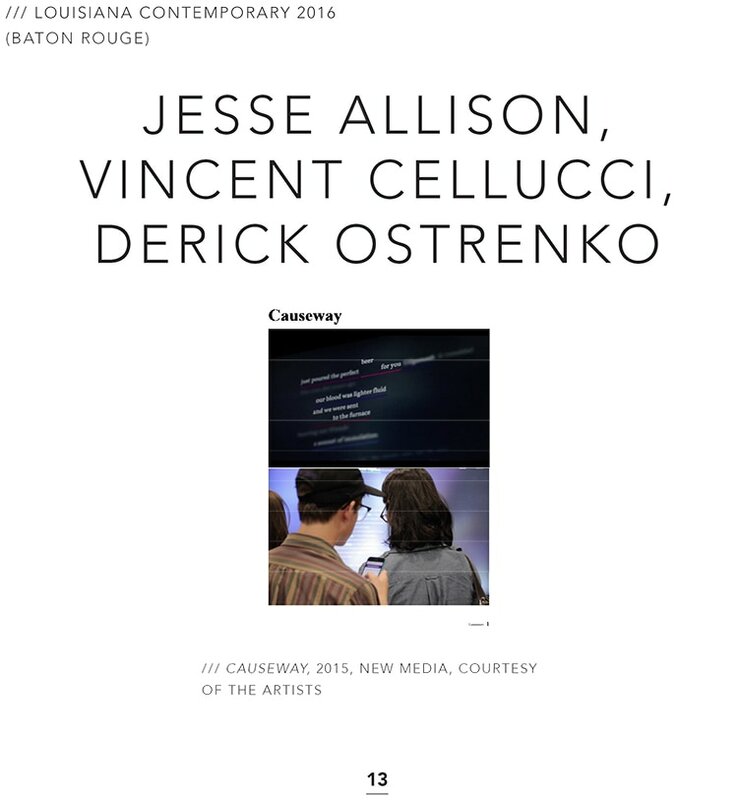 NIME 2016 'Causeway' Vincent Cellucci (Poet), Jesse Allison (Live Audio & Web App), Derick Ostrenko (Live Video & Web app) from Music Technology QCGU on Vimeo. Causeway is an interactive poetry app and performance (10 mins) written by Vincent Cellucci with audio by Jesse Allison and visuals by Derick Ostrenko. The piece-- performed for the Katrina@10 Symposium (8.27.15) and Digital Divide--can be experienced as a performance or by itself as a mobile application. When Causeway is put on as a performance, Cellucci reads the poem aloud while audience members interact by tapping phrases from the poem on their mobile devices to collectively transform visuals displayed on a large projection. Each tap produces a sonic echo taken from Cellucci's voice and causes his words to ripple through the theater. As an application this experience is containerized on the mobile device so that many users over time contribute to an ongoing visualization. We also turned a containerized version of Causeway into a new media, interactive installation displayed in Louisiana Contemporary 2016 (a statewide, juried exhibition) at the Ogden Museum of Southern Art in New Orleans.